I have to preface this by saying that I own an irobot roomba, and I freaking love it. Anyone who is still pushing and pulling a vacuum cleaner back and forth across the floor instead of living life while a robot does a way better job of it must be a fool, a Luddite, unaware of the possibility, or just a poor soul who can't scrounge up $119 for a robot vacuum. 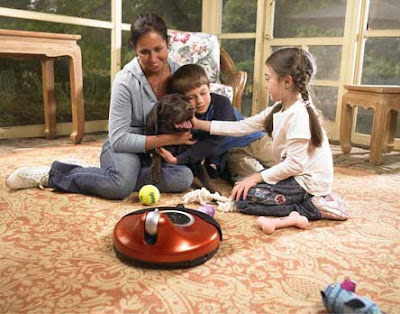 iRobot® ConnectR is a totally new kind of connection device designed for busy parents and distant grandparents seeking greater connection and involvement with their kids, grandkids and pets. Combining the latest in Internet communications and robot technology, ConnectR lets you virtually visit with loved ones, relatives and pets anytime you wish. Now you can see, hear and interact with them in their home as if you were there in person. Affordable and easy to use, ConnectR enables real-time virtual visits over the Internet. Equipped with high-quality audio and a video camera, the robot is located on-site in the home of the “host” party. Using a computer keyboard, mouse or joystick, the remote (“visiting”) party can drive the robot around and interact with those on-site, virtually participating in activities at home or wherever the device is located (for example, in the home of your grandchildren). The on-site host party can also direct the robot’s movements with a remote control.